The majority of Redon’s paintings and pastels on view were relatively recent, dating from 1900 to 1912. He was still creating black and white prints during those years, but in his paintings and pastels this was a period of rich color and fantastical imagery with an overall serene, lyrical feel. He derived his subject matter from mythology, as in Head of Orpheus; from masterpieces by earlier artists, as in Le Silence; and from his own rich interior life, as in Profil nour sur fond or, No. 111 (now titled Paul Gauguin (1848-1903). Portrait painted after the death of the painter), an evocative posthumous portrait of one of his closest friends. Redon’s opulent color and poetic and mysterious imagery made his work a hit with the press and the public alike. 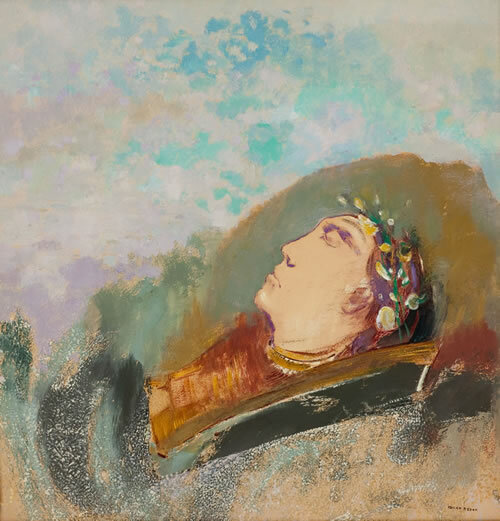 Even the most conservative critics praised him as “a purposeful dreamer” and his work as “fantastically beautiful art, very far from life, admirably true to its own vision.” Brisk sales of Redon’s work at the show’s New York venue illustrate the public’s enthusiasm. Thirteen of his paintings and pastels and twenty prints were sold to tastemakers including Daniel Morgan, Lillie P. Bliss, and John Quinn. Armory Show exhibitors Katherine Dreier and Robert Chanler purchased Redon lithographs, and the critic Harriet Monroe bought one in Chicago.